hello color my kitchen readers! it’s been too long since i’ve posted…life gets busy and certain things fall to the wayside unfortunately. however, i’ve been constantly testing new recipes and this one is excellent and EXTREMELY flavorful, healthy and simple—not to mention colorful! since we are pretty much nearing the end of the citrus season, time is of the essence if you care to try the salad. preheat oven to 425 degrees. thinly slice the citrus (attempt to make them the same thickness). toss with olive oil and salt/pepper and roast for 20-25 minutes (watch closely for possible burning…you want them charred, but not burnt). this caramelizes the citrus and sweetens it. 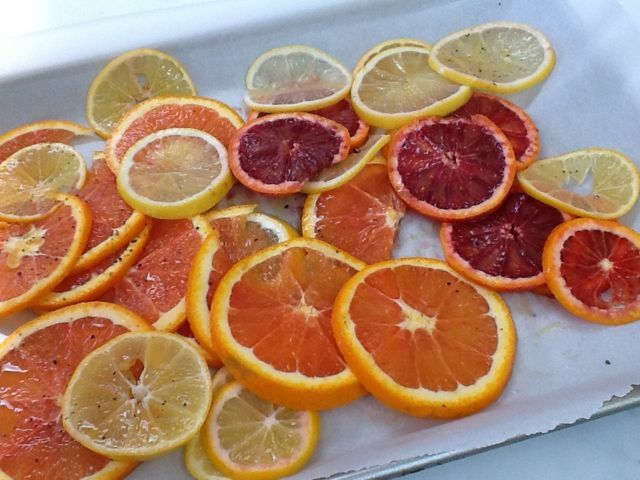 set roasted citrus aside to cool. meanwhile, combine thinly sliced onion and juice (with a bit of cold water) in a bowl, set aside. cut avocado into wedges. arrange salad on platter: greens interspersed with mint leaves, citrus slices layered around perimeter; drained onion slices on top of greens; and the “crowning” element, the wedges of avocado sprinkled with julienned mint leaves. good olive oil/balsamic vinegar drizzled over the top when serving. i adapted this recipe from the january 2015 issue of BON APPETIT, one of my favorite foodie magazines. i also think it would be nice with added raw pistachios and/or toasted walnuts. if you love citrus, as we do here in the burgeno-berman household, you will enjoy this salad. 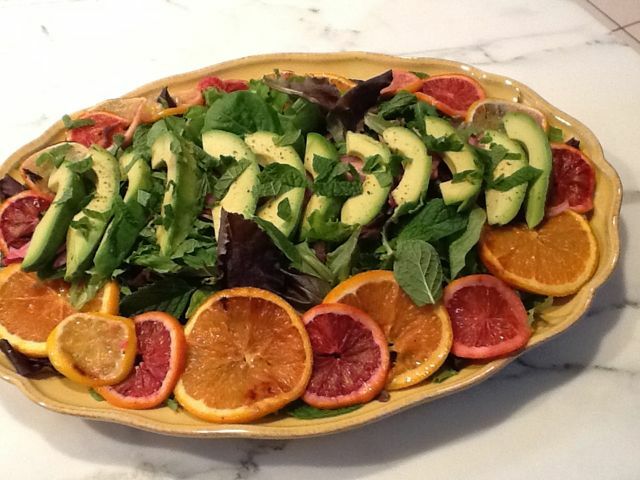 This entry was posted in salad, seasonal creations and tagged avocado, citrus, colorful, healthy, mint by Elena. Bookmark the permalink.